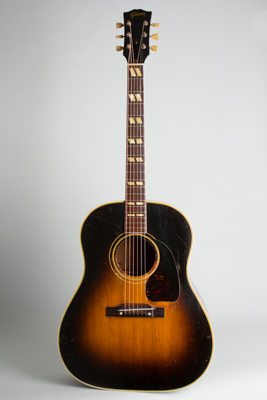 Gibson SJ Southern Jumbo Model Flat Top Acoustic Guitar (1952), made in Kalamazoo, Michigan, serial # Z 2778-8, sunburst top, dark back and sides finish, mahogany back, sides and neck, spruce top, rosewood fingerboard, black hard shell case. The SJ or "Southern Jumbo" sometimes feels like a bit of a forgotten model in Gibson's postwar flat-top line; not as simple a working man's guitar as the more austere J-45 but not as yee-haw fancy as the big 17" SJ-200 or J-185. The SJ features the same basic construction as the more familiar J-45 with a sunburst spruce top on a 16" slope-shouldered mahogany jumbo body, with a mahogany neck and rosewood fingerboard. The cosmetics of the SJ are fancier than the J-45 all around. There are multiple layers of binding around the body and sound hole, and the fingerboard is bound with pearloid double parallelogram inlays. The rosewood bridge is a top-belly design, which looks rather like an upside-down Martin bridge. This 1952 model has some general play wear and repair but still sports a very sharp look, and more importantly, a big warm sound. Don Everly used a very similar 1953 SJ to create the famous open-tuned chord hooks on the Everly Brothers' early records, and this guitar has that same punch and plenty of ring when pushed. This is a very fine playing example of this classic Gibson flat-top, the kind of guitar that makes you want to sit around singing country songs all night, even if you're in the middle of the city. Overall length is 40 3/4 in. (103.5 cm. ), 16 1/4 in. (41.3 cm.) wide at lower bout, and 4 7/8 in. (12.4 cm.) in depth at side, taken at the end block. Scale length is 24 3/4 in. (629 mm.). Width of nut is 1 11/16 in. (43 mm.). This old SJ shows play wear and some typical repair but really does have a resounding sound, sweet and crisp at the same time. The neck has been neatly reset with some overspray extending to the sides and heel area. The bridge and frets remain original; the frets have been recrowned and the bridge reglued neatly. There is some strumwear to the top around the edges of the pickguard that had the finish patched in a bit, not professionally but not too glaringly. There is a repaired grain crack under the bottom edge of the pickguard, sealed up but visible. Other than this, the guitar appears crack free. The finish on the back has a couple of long scratches, and there is moderate checking overall. The middle back brace has been reglued rather sloppily but is solid, and there is a small patched area of wood on the underside of the main X brace, which has been reglued as well. There is a small patched jack hole in the side, rather forward of the typical spot. The fingerboard has some noticeable divoting in the lower positions, with an unusually deep one behind the second fret under the first and second string. This is not bothersome from a playing standpoint, but is noticeable. The frets have also been lowered somewhat but still play well. The back of the neck has some capo wear spots in the lower positions. The tuners are recent Kluson reissues with keystone buttons. This guitar is a great-sounding survivor, superbly light and resonant and a joy to play. Very Good + Condition.